After their own reports showed trillions of dollars "missing" from ledgers, DoD is now getting its first audit in its entire history. 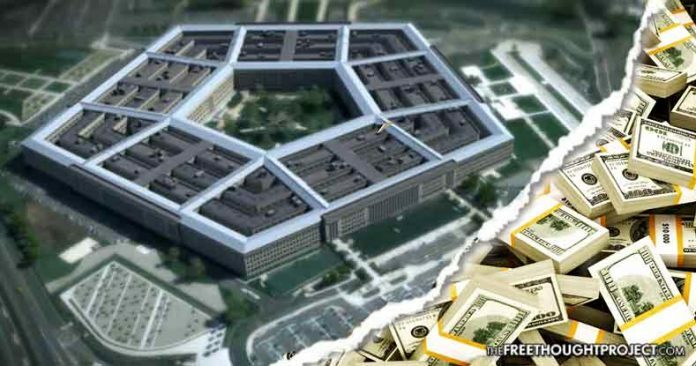 “The Defense Department is starting the first agency-wide financial audit in its history,” the Pentagon’s news service said this week, announcing that they are finally going to follow through with something they promised to do for years. In what will likely be an immense and highly politicized dog any pony show, the Pentagon is now claiming this will start immediately. “It demonstrates our commitment to fiscal responsibility and maximizing the value of every taxpayer dollar that is entrusted to us,” chief Pentagon spokesperson Dana W. White said. “Beginning in 2018, our audits will occur annually, with reports issued Nov. 15,” the Defense Department’s comptroller, David L. Norquist, said, noting the audits will now be an annual task. Exactly what will come of this enormous feat of counting the money spent on spreading the American empire remains a mystery. However, what is not a mystery is the trillions that have “gone missing” as a result of the Pentagon’s refusal to comply with 20 years of audits. As TFTP reported at the time, a Department of Defense Inspector General’s report, released in 2016, left Americans stunned at the jaw-dropping lack of accountability and oversight. The glaring report revealed the Pentagon couldn’t account for $6.5 trillion dollars worth of Army general fund transactions and data, according to a report by the Fiscal Times. While there is nothing in the IG’s report specifying that the money has been stolen, the mere fact that the Pentagon can’t account for how it spent the money reveals a potentially far greater problem than simple theft alone. Also, other reports put the toll of missing money upwards of $10 trillion. The accounting errors and manipulated numbers, though obviously problems in their own right, highlight a far greater problem for the Defense Department than only bad recording keeping and wasteful spending habits. In reality, they are a representation of the poor decision-making, and lack of oversight and accountability that plague our nation’s government as a whole and this audit, however promising on the surface, will likely prove to be more of the same.